Imagine the spectacular views you and your guests will have with a Chicago private yacht rental on Lake Michigan with all amenities and privacy Adeline’s Sea Moose has to offer. The Annual Chicago Air and Water Show is along the lakefront from Fullerton to Oak Street, with North Avenue Beach serving as show center. The popular lakefront event features a wide variety of military and civilian aerial demonstration teams with daredevil pilots performing their stunts in the skies above Chicago. 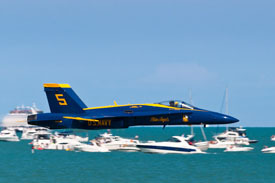 The Blue Angels have been astounding audiences since 1946 with their commanding presence and aerial maneuvers. The sights and sounds will leave you in awe. The U.S. Army’s Parachuting team, the Golden Knights, will also be headlining this year. Over 12,000 feet in the sky, these brave souls will be racing towards Chicago at over 120mph. The Navy’s Parachuting team, Leap Frogs, will also be performing from a starting altitude of 12,500 feet. Many other civilian aircrafts will participate in this year’s show including Sean D. Tucker & Team Oracle as well as the Red Bull Air Force, an elite group of skydivers.